Jack and the Beanstalk was written by company director earlier this year to bring the classic pantomime spectacular bang up to date and give it a very unique Stage Stars touch. Our story begins where after the Fairy and Poison Ivy have had their first argument we meet Jack and his Dame mother who are struggling to find the rent they owe the King. After trying everything else they decide their only alternative is to sell their beloved cow Daisy. Jack however manages to sell her to the evil Poison Ivy who tricks him into an exchange with magic beans. The dame is furious with Jack but soon changes her mind when they discover in the morning the magic beans have turned into a giant beanstalk. 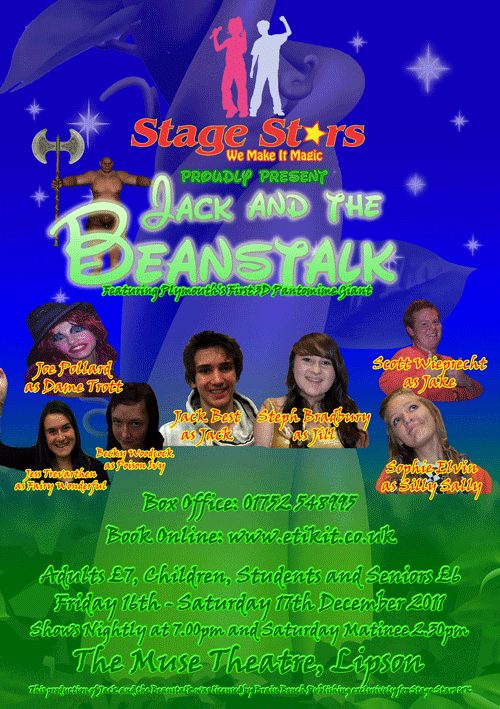 Jack begins his climb up the beanstalk to rescue Daisy and his new love Jill who has also been captured by the giant. At the top Jack meets the Fairy who vows to help him while back in the village after a disastrous sleep over the King, Sally and Dame all decide to go up to cloudland to help Jack. At the top they all team up and soon reach the giants kitchen where they find Jill and Daisy. Just as they are leaving however the Giant wakes and after a fight they begin down the beanstalk where Jack starts to chop. Unfortunately the axe is blunt and the only way to get the beanstalk down is for the audience the help by throwing the fairies magic squares at the beanstalk. Will they be able to help Jack save the day or will the Giant reach Merry dale. Only the audience can decide in this spectacular adventure.